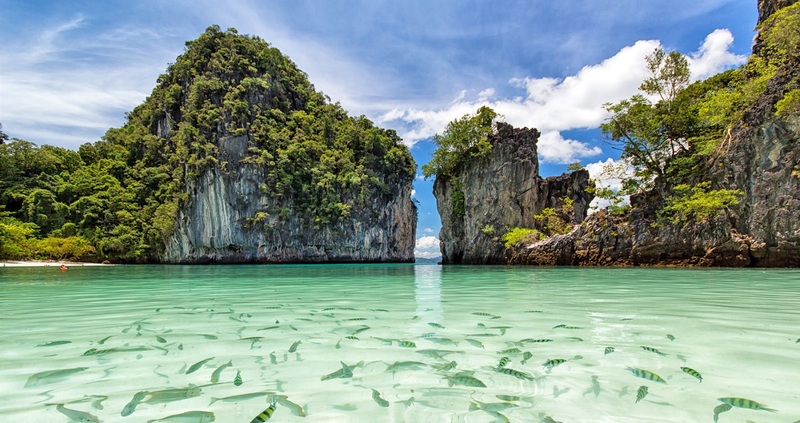 In the west-facing Andaman Sea coastline lies the famous island of Phuket in the southern part of Thailand. Wonderful dining experiences, vibrant nightlife, and live postcard views are what anyone can expect to find. It is a worldwide paradise for those who love sunbathing, snorkeling, kayaking, bodyboarding, and scuba diving. 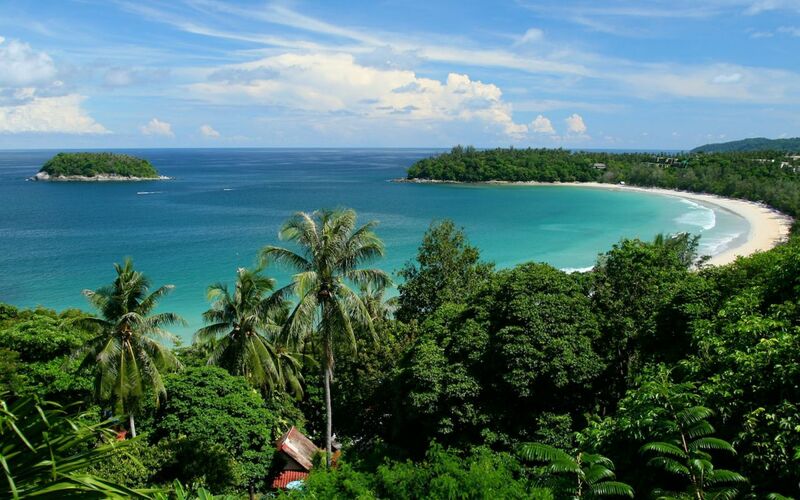 Beaches in Patong, Kata, Karon, and Kamala are the tourists’ favorites. 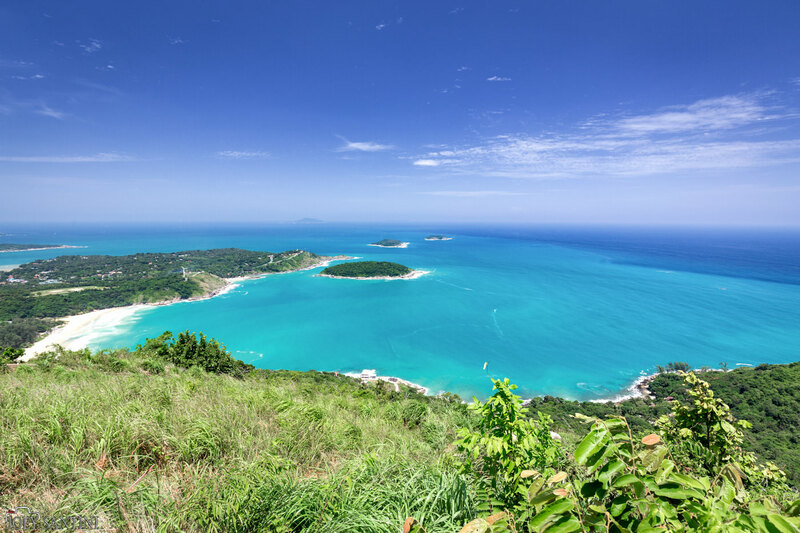 In recent years Nai Harn, the southern tip of the island, Freedom Beach, a 300m-long strip of white sand near Patong, and Paradise Beach, hosting the moon festivals have been “discovered” by foreigners. Not only tourists are making Phuket one of the most popular destinations in the world. Also, more people are choosing this idyllic island to exchange wedding vows or to spend their honeymoon in breathtaking scenarios surrounded by pristine sand having palm trees, and light blue beach waters in the background. Heritage buildings make the scene of Phuket Town. 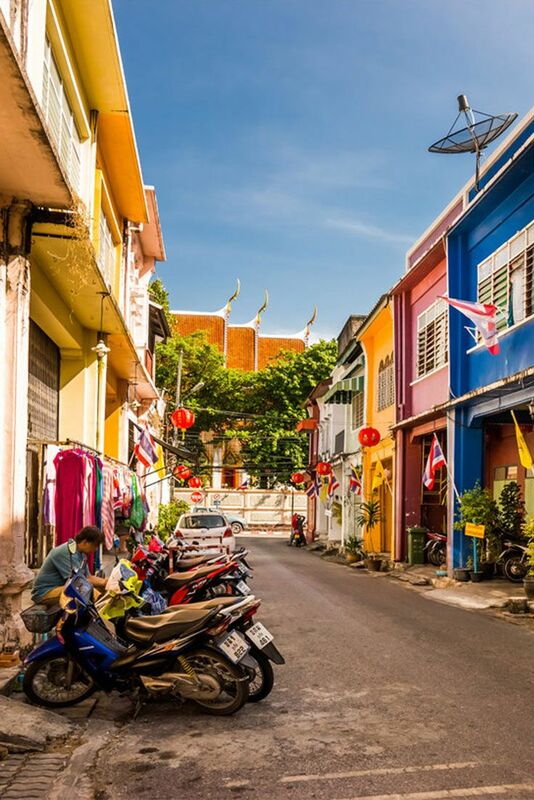 While visiting Thalang Road in the heart of the charming Old Town. One emerges immediately into the identity of the neighborhood, where a large Sino-Thai community is keen with its traditions. Colorful Sino-Portuguese 2-story buildings with shops on the ground floor make the day of any professional photographer or selfie lover. A mix of restaurants with tasty food adds to the bustle of this 600-meter road length. Every Sunday, the tourists can enjoy the Phuket Walking Street, or “big market” from “Lardyai” (a southern Thai dialect word). It spans from the Thepkassatri junction right to the end of Thailang Road. Stalls selling inexpensive clothes, souvenirs and food make this family-oriented venue especially popular among tourists. Memory at One One Hotel, Thai Hua Museum, Phuket Philatelic Museum, Phuket Provincial Hall, China Inn Café, Baan Klung Jinda Restaurant, Baan Chinpracha, and Phuket Governor’s Mansion (now housing the famous Blue Elephant Restaurant) are attractions with wonderful architecture. 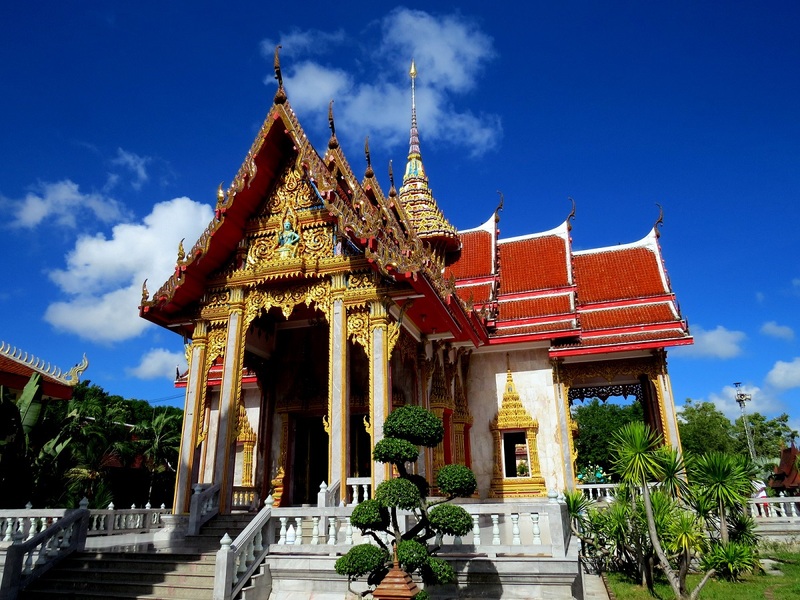 Built in the 19th century, Wat Chalong is the most revered temple of the island for the sacred relic of Buddha – a fragment of a bone – that is kept there. Also revered is the Phuket’s Big Buddha, a 45 meters’ tall image that sits on the top of Nakkerd Hills. 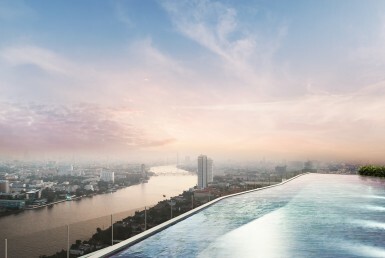 There are several viewpoints with stunning landscapes worth to figure in any beautiful painting, namely Black Rock, Karon Viewpoint, Khao Rang, Laem Singh, Monkey Hill in Phuket Town, Panwa Viewpoint, Phuket Big Buddha (offers the best 360-degree views of the island), Promthep Cape and Patong Mountain Bar, among others. Vibrant nightlife is found in Bangla Road, full of bars, clubs, discos, and cabaret shows. Bright neon lights give a special color to the spot. All nearby the shopping mall Jungceylon, in the center of Patong. In Kamala, one can experience the FantaSea, which is the island’s biggest show with trapeze artists and hundreds of animal, mainly elephants, drawing a fantastic storyline. Phi Phi Island and Coral Island boast the excitement of adventure for those who seek to explore additional tropical places. All within reach by the thrilling speedboat trips. Crossing the northern Phuket’s bridge to the continent one arrives at Phang Nga Bay. James Bond Island is easily reachable by a longtail boat or a speedboat. The Island gained worldwide fame after the 007’s blockbuster movie. Its main feature is the famous reversed bullet-shape rock. The floating village Koh Panyee is another famous spot of the bay, full of spectacular views of islands bordered by the emerald-green water. Last year a record of 38.27 million tourists entered in Thailand, up 7.5% from 2017. Last December tourist arrivals were 3.85 million. As of February this year the major number of tourists are from Mainland China, making 56.17% of the total. Figures show nationals from Russia (5.19%), India (4.73%), Japan (4.56%), Korea (3.88%), and Vietnam (3.45%) arriving in Thailand. Those ahead of Ukraine, Germany, United Kingdom, Taiwan, France, Indonesia, USA, Hong Kong, Malaysia, and others. The trend follows in Phuket with Chinese being the major group of visitors, followed by citizens from Australia, the United Kingdom, Russia, India, Japan, and Scandinavian countries, among others. Despite the slowdown on the second half of 2018, the worries expressed end of last year regarding the plunging number of Chinese tourists coming to Thailand in the aftermath of a tour boat disaster off Phuket are now fading. Taking into consideration, the boat incident in July last year didn’t bite the real estate market in Phuket. Not only Chinese are arriving for tourism and leisure. 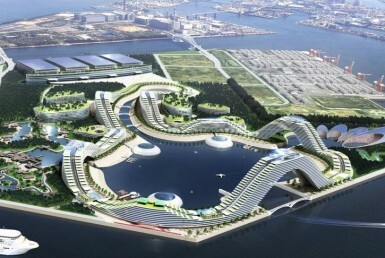 But more are placing their cards on real estate as freeholders or even leaseholders. Preferably, in the Patong area. Also, investors from Russia, Hong Kong, Singapore, and Scandinavian countries are aiming high. Data collected by Angel Real Estate shows the last half-yearly strong performance since 2012, making it the 4th best on condo units sold and the 6th best on villa units. 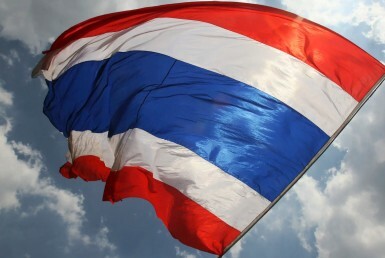 Despite Thailand’s economy is expanding at a slower pace. As tourism growth continues, the demand for hotel and residential markets remain high. Basically, buyers of all prices are looking to properties that can grant them rental income from those assets. Either resort condominiums or villas. Depending on the location, the land price and the reliability of developers to meet the demand’s expectations yields can be highly attractive to buyers, reaching as much as of 7%.